Notional Identities takes up the challenge of engaging with the popular genres of speculative fiction and crime fiction by Scottish authors from the mid-1970s until the beginning of the twenty-first century, examining a variety of significant novels from across the decades in the light of wider considerations of ideology, genre and national identity. The book investigates the extent to which the national political and cultural climate of this tumultuous era informed the narrative form and social commentary of such works, and considers the manner in which - and the extent to which - a specific and identifiably Scottish response to these ideological matters can be identified in popular prose fiction during the period under discussion. Although Scottish literary fiction of recent decades has been studied in considerable depth, Scottish popular genre literature has received markedly less critical scrutiny in comparison. Notional Identities aims to help in redressing this balance, examining popular Scottish texts of the stated period in order to reflect upon whether a significant relationship can be discerned between genre fiction and the mainstream of Scottish literary writing, and to consider the characteristics of the literary connections which exist between these different modes of writing. The book examines and compares eight novels in total - four for each chosen popular genre - using each text under discussion as a facilitator to engage with the wider genre at large over the course of several decades. From the field of speculative fiction, Notional Identities examines texts by the authors Iain M. Banks (The State of the Art, 1989), Ken MacLeod (The Stone Canal, 1996), Margaret Elphinstone (The Incomer, 1987) and Matthew Fitt (But n Ben A-Go-Go, 2000). The discussion then turns to crime fiction, with an analysis of novels by Ian Rankin (Knots and Crosses, 1987), Christopher Brookmyre (Quite Ugly One Morning, 1996), Denise Mina (Garnethill, 1998) and Louise Welsh (The Cutting Room, 2000). As well as evaluating the work of each author and its relevance to other texts in the field, consideration will be given to the significance of the novels under discussion in relation to wider considerations of ideology, genre and national identity which were ongoing both at the time of their publication and in subsequent years. 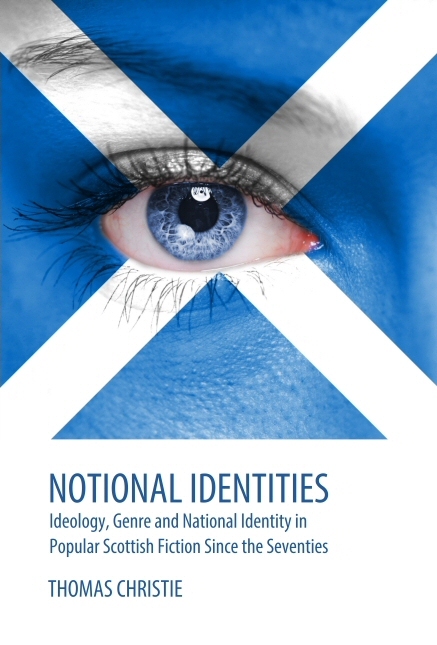 Notional Identities: Ideology, Genre and National Identity in Popular Scottish Fiction Since the Seventies is the culmination of five years of literary research. In many ways, the project was something of a labour of love: an opportunity to examine popular genres of Scottish fiction over the past several decades and to discover the commonalities that can be established between the work of authors working in this field and the mainstream of Scottish literary fiction throughout the same period. I have always felt strongly about the often-neglected literary merits of popular fiction, and this book gave me a perfect chance to explore exactly what it is about Scottish science fiction and crime fiction (most especially in the Tartan Noir style) that has made these modes of writing so vibrant, adaptive and varied. The period under discussion did, of course, see many political and social changes taking place in Scotland, and it was interesting to chart the way in which popular genres of Scottish fiction developed over the years in order to reflect cultural transformation and competing ideological viewpoints. In the course of my research, I met two of my literary heroes, namely Alasdair Gray (author of the legendary Lanark: A Life in Four Books, 1981) and the late, great Iain M. Banks (creator of The Culture novels, 1987-2012), both of whom were kind enough to spend time discussing their work with me. I felt hugely privileged to have spoken with so many literary scholars and arts professionals throughout the course of this project; it really did make the experience every bit as enjoyable as it was thought-provoking, and certainly reminded me of why I feel so passionately about all aspects of the writing process.